Although most of us are photo and video lovers, you have to admit – there’s no good video without good audio. You can watch a video with poor video quality, you’ll get through it. But it’s quite difficult and annoying to watch one with bad sound, with lots of muffling and crackling. Audio plays a huge role in telling the story and rounding up the video work. So, Peter McKinnon tells you more about it. Here are some ideas how to incorporate good music and sound effects into your videos, how and where to get them and how to use them to make your videos amazing. Getting audio gear is probably not the most exciting for photographers and videographers. We’re more hyped about the lenses, cameras, and stuff that add to the visual quality. But just because we overlook the audio so often, that’s why we may end up with a bad video in terms of sounds. Here are some ideas how to pay more attention to the audio, and the best ways to get it and include it in your video work. You can get creative when you use the sound effects. It doesn’t need to be the actual sound of the action you’re filming. I’m sure you’ve seen some of the clips how practical sound effects are created for the movies. I find them super-fun to watch, and you can also learn a lot from them. In his example, Peter used a sound of a jail door slamming to recreate the sound of his friend hitting the ground on a skateboard. Another great way to get creative is to match the audio to the camera movement. It makes the video more impactful, accentuates certain movements and creates an interesting and engaging video. There are websites that offer all sorts of music and sound effects, and Peter uses epidemicsound.com. They offer plenty of songs you can use for your videos without being flagged. But what’s more, they have a huge base of sound effects. When you subscribe, you have the access to all their content, and you can browse through it, download what you need and with time create your own library of sounds to always have it accessible. If you’re somewhere and you notice that the audio is good, you can record some of the environment. It doesn’t need to be only for the specific purpose. You can save those sounds in your library and use them when you need them, just like with the B-roll footage. 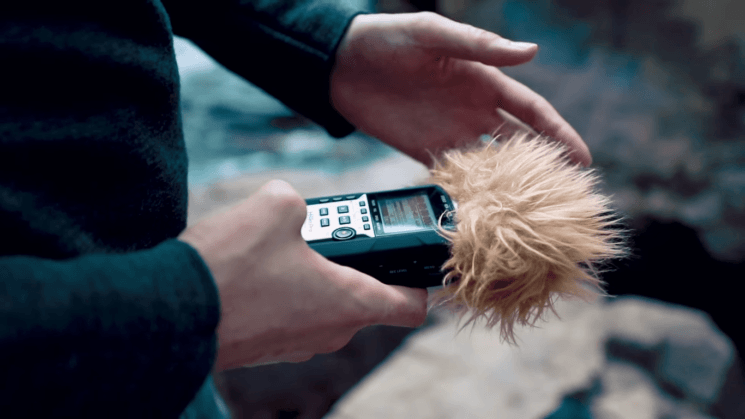 While your smartphone could do in some cases, it’s better to get a sound recorder. You can have it with you so you can record the room tone and the environment around you. And if you need a good microphone, you can check out three of them compared here to make your choice easier. I don’t shoot videos (yet), but I enjoy the theory and learning about it. I found Peter’s video very informative, and I know I’ll apply his tips when I start making videos. And as a viewer, I really find sound important and I have a hard time watching something with bad audio. If you shoot videos, how much attention do you pay to sound effects and audio in general? Do you find it important for the story just like the visual part?